But I sure do wish that her devotion didn’t include drooling. It was all I could do to get an unobstructed shot of my new favorite thing in the world (besides the cat, of course). 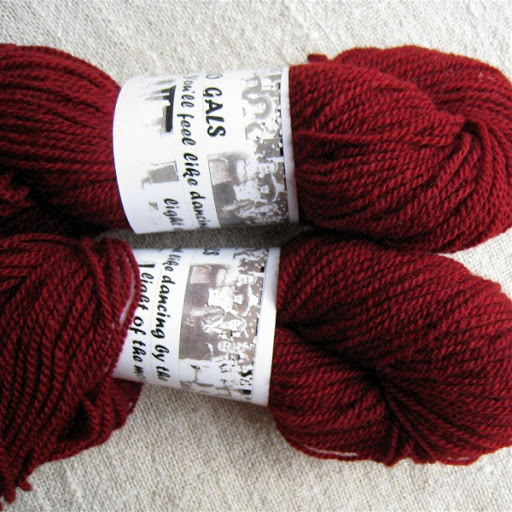 This is Buffalo Gals Bison Merino 2-Ply in Garnet. Clara Parkes reviewed its cousin, Bison Merino 3-Ply, in this past week’s Knitter’s Review newsletter. I don’t post about most of the yarn I find, but this one deserves the spotlight. It is so soft, so sweet, and such a deep, rich color. I happened to click on the newsletter just as it was posted late Wednesday night. This yarn spoke to me in a sweet voice, yet a firm one. I didn’t even attempt to think it over. I was also extremely impressed by Judith MacKenzie McCuin’s journey with this fiber, and I wanted to support her effort. Before the page had finished loading I think I was on my way over to Carolina Homespun to place an order (I heart Morgaine). Now that I have it in my hands (or wrapped in a cloth to keep somebody from rolling in it) and can feel it and make plans for it, I want more. I’m resisting for now, but that Montana Nights blue is gorgeous. 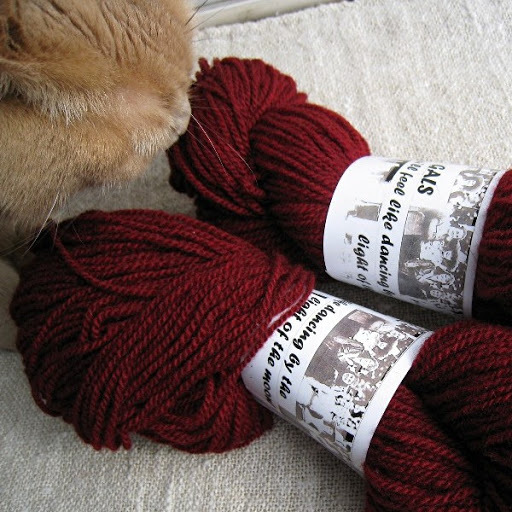 As Clara pointed out, this is not an inexpensive yarn, but it’s also in limited supply. I know I’ll treasure the knitting and the wearing. But some days — some weeks, even — my idyllic, romantic job leaves me drained and speechless. It’s over now, and it wasn’t a crisis, but it sure was complicated, uncomfortable and exhausting. Now I really am looking forward to going to work tomorrow! Well you know some yarns are so nice you can’t help but drool over them. 🙂 I love that shade of red! I hope next week is easier. What a color! wonder where I can dig up a little $$.Can’t wait to see what you do with it. I heart Morgaine and Lann too 🙂 I’ve known them so many years – they started their business the same time we began CMF… they are so dear.Buffalo Gals.. woo hoo. I will be seeing Juidth at a class in another week, and I’m hoping that she’ll have some with her. It’s scrumptious.May this work week ahead be filled with peaceful days. the color is a lovely deep red. it must be so soft. looking forward to see what it’ll be when it grows up! The color is breath taking and very warm feeling even on the flat screen – whoo!I may peek at it again besides reading the article that gave it a wonderful debut!Work is work and I would love to work in a Bookstore – and have – but I got caught reading too many of the products and not working enough – imagine that! 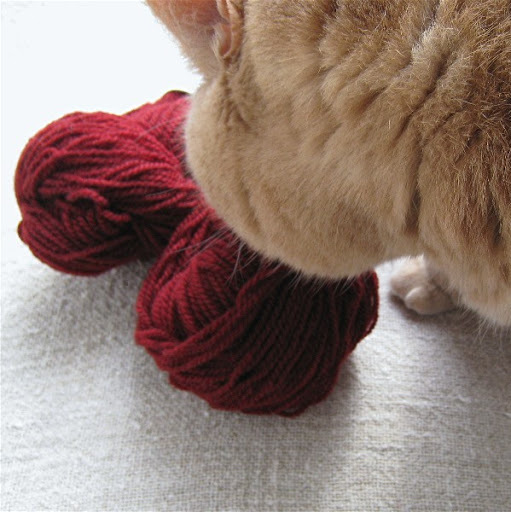 Rest up – most days I love my job – but there are moments!Wish I lived close enough to see the cat and the yarn in person! Are all pint-lions droolers? Yarrow sure is. Love the color of that yarn. It really is a true garnet. Yum! I promise I won’t drool though.Work – every day is completely different than the one before and the one to come. I never know if I’m going to be exhausted or energized at the end of a day. Same goes for dog walks. Sometimes they’re just perfect, other times we struggle our way through the whole thing. Life is completely unpredictable, isn’t it?